MAT 2018 (September) will be conducted by AIMA. The MAT exam will be a paper based test as well as a computer based test. MAT is a national level MBA Entrance Exam which is held four times a year that is February, May, September and December. Candidates who are willing to get admissions in various MBA colleges in India can apply for Management Aptitude Test. The conducting body AIMA has declared the result of MAT May 2018 on 25 May 2018. AIMA MAT Registration 2018 for the September session has started from 29 June 2018 for all the eligible candidates. 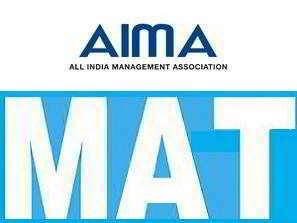 MAT 2018 is a computer based test which is organised by AIMA (All India Management Association) for admission in MBA courses into various B-schools. Management Aptitude test is a government-approved entrance test which is conducted for the candidates to provide them MBA admissions offered by various management institutes in India. All India Management Aptitude Testing services are conducting MAT since 1988. The marks scored by the candidates will be acceptable in many B-Schools at national as well as International level. This page will help all the candidates to know all about MAT 2018 and other related information like important dates, eligibility criteria, application form, admit card, result, exam pattern etc. Latest Update: The MAT Registration 2018 will remain open for the MBA aspirants till 24 August and 8 September for paper based test and computer based test respectively. The candidates will be required to move forward to the MAT Registration process and get them registered to the official website of AIMA MAT. The MAT Registration process will be an online process. Candidates must keep their documents ready before they go to fill their MAT application form. The documents such as – valid email ID, mobile number, certificates related to their education, photograph (JPEG format - 5 KB to 50 KB), and Debit/Credit/Net banking for application fee payment etc. Step 2: Register by providing name, email, and mobile number. Step 6: Pay the MAT Application fee and download the application form. Candidates are required to follow these steps carefully. After submitting their MAT application forms successfully the applicants are requested to take a print out of their confirmation form for future references. They need to keep the print out of their MAT confirmation form until and unless the admission process is completed. All India Management Association released the list of exam centres across India and overseas. The candidates who are willing to apply for the MAT 2018 exam must go through the list of exam centres and then choose an appropriate centre for them. The various cities where the MAT Exam will be conducted are like Agra, Ahmadabad, Ambala, Bengaluru, Bareilly, Bhopal etc. Candidates can get the full list of test centres by clicking on the below link. Candidates who are willing to apply for MAT 2018 (September) entrance exam must go through the syllabus. MAT syllabus 2018 is derived from the previous year question papers and official sample papers. Going through the syllabus candidates will get an idea of the entrance exam and can prepare themselves accordingly. Before appearing in the MAT 2018 entrance exam candidates must revise application skills, comprehension, analytical abilities along with general awareness. MAT September 2018 will be of 3 hours duration and all the questions will be in multiple choice only. Candidates who have registered themselves to appear in MAT 2018 (September) are required to download the admit card by the second week of September 2018. MAT Admit Card is an important document to be carried along while a candidate visits to take the entrance exam. Candidates must note that specific admit card will be generated for the candidates who have applied for both paper-based and computer-based exam also. MAT admit card 2018 will include various details such as candidates name, contact details, test centre, the timing of the exam, venue address. The candidates who are appearing for computer-based entrance exam must strictly follow the date and time. After getting their scorecards the applicants are requested to take a print out of their MAT result 2018 for future references. Candidates can also receive their scorecards on their mobile phones by SMS. Here is a list of some colleges with their MAT cut off percentile, fee and average placements. Candidates must go through the list thoroughly as more than 300 institutes will offer admission into MBA on the basis of MAT scores. MAT Answer Key will be available after the commencement of the MAT 2018 exam for the candidates who appeared for the exam. It will be released before the announcement of the MAT result. MAT Answer Key will help the candidates in calculating their probable score. By this, they can estimate their result and they will be able to prepare for the further selection processes. Practising with previous years MAT Question Paper will help the candidates in getting familiar with the MAT exam structure and exam pattern. They will be able to know about the type of questions could be asked in the MAT exam 2018. In order to qualify the MAT exam, practising with mock tests is also very much important. MAT Mock Tests are available on various online platforms. It will help in managing time and the candidate will be able to finish the paper on time. It will also help in predicting the percentile you can get in the MAT 2018 exam.